Be sure to use the proper glue for the project you are working on and use the right tool to apply it. When in doubt, ask the manufacturer you purchased the veneer hobby packs from. Also, be sure to apply the right amount of glue to both the veneer and the substrate. Be sure to prepare substrate surfaces properly. Doing a dry run before you begin gluing is the best way to know you have enough veneer for your project and that everything is going to fit together properly. It is better to learn you need more veneer hobby packs before you start the gluing process. Understand the relationship between your substrate material and the veneer, including the strengths and limitations of the veneer and whether there are any special rules to follow, such as the need to veneer cross grain on plywood. Start with a smaller, less important project before jumping to a more endearing and costly one. Have all supplies you’ll need handy, including tools for handling any problem that might arise, so you can fix it timely and easily. If you are looking for quality veneer hobby packs that will give you amazing results for your woodworking projects, turn to us at Sauers & Company Veneers. We have been around for over 50 years and have supplied some of the largest domestic furniture manufacturers. 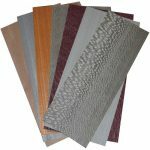 Our selection far exceeds that of any other supplier of veneer hobby packs, so you are assured of a successful project. Contact us today with any questions you may have.